Alabama now has the SEC's longest winning streak at 4 after holding off the Bulldogs to remain just one game back in the conference standings. It was a tale of two halves. Collin is still out, so we stuck with the starting lineup of Dazon, Petty, Herb, Key, and Dan. I was hard on Dan after his last game, but he stayed out of foul trouble and dominated the paint in the first half, scoring 10 points and setting the tone early. We had great spacing and ball movement, Petty made a couple of 3s, and Key re-emerged as a scoring threat with 7 in the first half and 16 total for the game. JP also had a couple of beautiful passes, including a no look over the shoulder, for assists. If we could have made more than 13 of 23 from the free throw line, then perhaps this game would have been put away sooner. Nevertheless, we had a very comfortable 19 point lead at halftime, but give a lot of credit to Ben Howland and $tate for not throwing in the towel. We missed 3 or 4 good opportunities for easy baskets early in the second half, and that seemed to throw the guys off their game a bit. $tate established their post game early in the half, and we countered by going big with Dan and Donta both in the game. This opened up the 3 point line, and Peters torched us, all the while exchanging trash talk with Collin on our bench. We moved Herb to Peters, which slowed him down, but then Weatherspoon made some big shots. All the while our offense came to a grind. $tate is a good defensive team, but we clearly lost some confidence on offense after missing those layups and we weren't cutting with the same purpose or moving the ball as effectively as we did in the first half. This led to a 5 minute scoring drought that allowed the Dogs to come all the way back and tie the game. While I'm disappointed that we took the foot off the gas a bit and blew a big lead; I'm proud of the guys for having some poise and finishing the game strong. Braxton broke the scoring drought as soon as they tied the game with an offensive rebound and put back. I think it was big psychologically that we never trailed in the game. The defense came up with big stops in the late possessions and we made just enough free throws to finally put the game away. 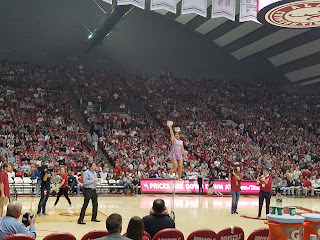 The highlight of the evening for me was watching Red Panda at halftime. Between seeing her once per year in Tuscaloosa and at various other events; I've probably seen her perform at least a dozen times. It's still as amazing to me as the first time I saw her. I've heard she earns $5,000 per show, if true, she's underpaid in my opinion. If you ever go to a game that she's performing, you do NOT want to leave your seat at halftime. The crowd was great, it was a sellout and there were very few empty seats. It seemed that $tate brought a lot fewer than they normally do. I would guess they had maybe 500 or so up in the corners, you could hear their "defense" chants at times in the second half, but they were otherwise unnoticeable, which is a good thing. Up next, we try to keep the streak going against the other Mississippi school, as the Tide travels to Oxford to take on the Ole Miss Rebels at 7:30 pm Tuesday night. It will be televised on the SEC Network.